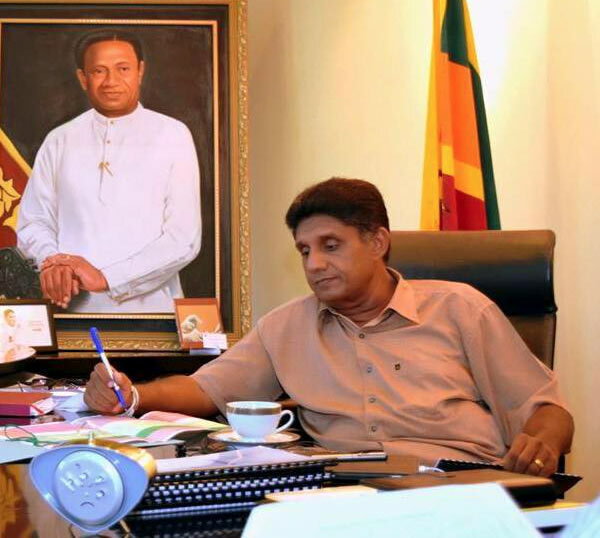 Amidst the intensifying political crisis in the country, a cross-section of Parliamentarians of the United National Party (UNP) openly requested Party Deputy Leader Sajith Premadasa to be the UNP Leader and the Prime Ministerial Candidate of the UNP in any General Election in the future. While participating in recent protests against the President Maithripala Sirisena’s arbitrary decision to dissolve Parliament, both UNP MPs Ajith P. Perera and Ranjith Madduma Bandara said that Premadasa should lead the UNP at the next presidential election and that he should be the Prime Ministerial Candidate. Participating in the recent protest in Bandaragama, Perera said that the Party would win any Election under the leadership of Premadasa and that a change in the Leadership was essential at the present moment. Meanwhile, at another protest in Moneragala, Madduma Bandara said that he would suggest Premadasa as the Party Leader. Elsewhere at a media briefing at Temple Trees, UNP MP S.M. Marikkar said that the Leadership change was essential to the Party and that the Party should move forward with a new Leadership. Before all UNP Members start protesting in front of Temple Trees, UNP Leader Ranil Wickremesinghe should vacate the seat, honour intact and install the much younger Premadasa as the Party Leader, stressed the National Organization for the Protection of the UNP during a press conference yesterday (12). Wickremesinghe did not do his best on behalf of the nation and he failed his Party Members during the 2002 UNP Government and the 2015 National Government, said the Secretary of the Organization Martin Wickramasinghe. “When he formed an alliance with President Sirisena, most UNP Members left the Party. Sirisena used to harass Polonnaruwa seat UNP Members when he was a Minister under former President Mahinda Rajapaksa’s Government, so that was the biggest betrayal of all. UNP Members are disappointed with the current leadership,” noted Wickramasinghe adding their Organization takes full responsibility if Premadasa becomes the Leader of the Party. UNP Members at ground level are all cheering for young Premadasa, as he is the much-vaunted Leader, who is in tune with the needs of the people. Only he who could influence everyone for better and furthermore young Premadasa is the only one who is capable of defeating both forces Sirisena and Rajapaksa, said the Gampaha District Secretary of the Organization, Premasiri Silva. When the Supreme Courts rules the Gamrala’s actions as s*** and unconstitutional, RW will be restored as the legal PM. However, the Gamrala has said he will not occupy his Golden Chair even for one hour if RW is restored. That means the Gamrala will resign his Golden Chair. And Guys, when a President resigns, the legitimate PM succeeds him. And, who is the legitimate PM? At the end of this fracas, RW will be President and SP will be PM. Don’t fall for Basil’s machinations. If the above is truely in the written SL constitution, and if anybody including the diplomats are capable of reading and understanding English with a basic level of IQ, it is nt difficult to guess at the Supreme court decision due at 5pm today going to be!!!! As a seasoned Legal Practitioner, I will not support picking up bits and pieces in any legal document including Legislation, Constitution, Statue etc and providing interpretations based on those bits and pieces. All legal matter should be looked at as a whole and interpreted accordingly. The Supreme Court just did that and issued the stay order because of the likelihood of a positive interpretation which favours the petitioners. All professions la including Doctors, Lawyers, Engineers are trained to look at the big picture in decision making; those who are half baked Lawyers who have political interests read and interpret only what is favourable to them. There are many from the Blu side who appear to be smarting. Most are reading paragraphs of the Constitution first time in their lives. Others have become experts overnight in interpretation of the Constitution and functions of the Judiciary. Why can’t these idiots shut their g*** and go to Parliament and vote when the Hon Speaker calls for a vote.